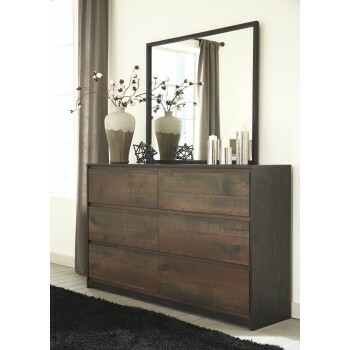 Dark brown replicated worn through paint and a rich rustic plank finish over Oak grain with authentic touch. Two-Tone modern appearance. Inset and hardware-less drawers. Side roller glides for smooth operating drawers. Slim profile dual USB charger located on the back of the night stand tops. Headboard legs have four height options for optimal relationship to bedding height. Queen (57) and King (58) headboards can attach to a bolt-on metal bed B100-31 or B100-66 respectively.